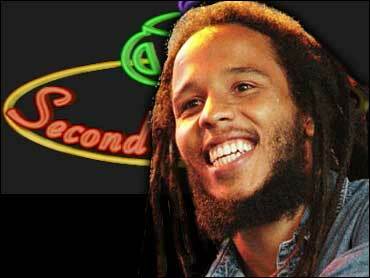 Ziggy Marley, eldest son of reggae artist Bob Marley, has performed music for the majority of his life. From sitting in on recording sessions with his father's band, Bob Marley and the Wailers, at the age of 10, to leading the Grammy-winning Melody Makers, which includes his brother Stephen and two sisters Sharon and Cedella, Ziggy Marley has acted as a musical ambassador from his home of Jamaica to the rest of the world. Now, Ziggy Marley departs from the Melody Makers to try a solo project called "Dragonfly." Marley visited The Early Show's Second Cup Café to perform a few singles from this new album. As part of Ziggy Marley and the Melody Makers, he helped sell millions of records and performed in numerous concerts. But, Marley says "Dragonfly" will be a departure from the familiar sound that Melody Makers fans are accustomed to hearing. He explains that his new album will explore new ground and create his own distinctive musical identity as a solo artist. He told VH1.com that the more he goes against the grain and experiments as an artist, the more he becomes like his father as an artist. Marley says it took a year to complete "Dragonfly" — the longest he has worked on one album. Recording outside Jamaica for the first time, he worked on it in Los Angeles and Miami. The result is an album that fuses reggae, R&B, hip hop, worldbeat and rock with political and personal messages. A review by Amazon.com says, "'Dragonfly' sounds closer to the adult contemporary music of recent Sting or R.E.M. than the reggae of his father. But even if the apple has fallen away from the music tree, Ziggy's voice has the same forceful yearning and brittle timbre as his father; also like his father, Marley wears his politics on his sleeve (particularly on 'Shalom Salaam' and 'In The Name Of God') without being rudimentary." The eldest son continues his father's legacy by making his own.